Free is an indispensable introduction to the disruption of “a product for a price,” one of the Industrial Economy’s key constructs. It is rich with examples of many of the pricing innovations and business models with which you’re probably familiar but haven’t thought about in depth. Many of its examples have to do with digital products, which are inherently disruptive because their distribution cost is close to zero, and they can displace legacy analog products. 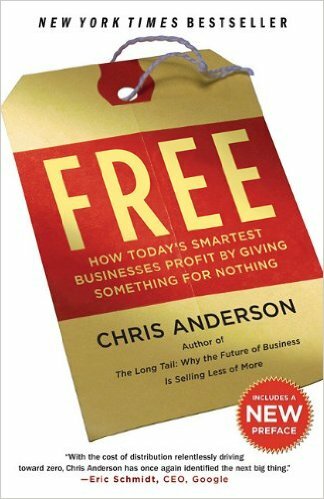 When something becomes free, it creates a new kind of scarcity and, in the Knowledge Economy, attention is scarce. As exemplified also in my review of The Long Tail, Anderson is talented at synthesizing and simplifying complex economic changes while retaining enough detail to solidify his arguments and keep it interesting. He reaches back into the 19th and 20th centuries to show some of the roots of free (the concept). For example, humans had to invent the concept of zero, back in the abacus days. Therefore, Free is interesting from this perspective, too. Below the book overview’s highlights of each chapter, Analysis and Conclusions shows how Free applies to innovation (and survival) in the Knowledge Economy. Ironically, the book is not free ;^) but you can buy it for almost free here. Part One: What Is Free? It was easy for hobbyists/geeks to copy and share software (that process was complicated then in terms of form factors, but there was no DRM, and they had the skills), but once computers went mainstream, most mainstream users didn’t have the skills, so they became willing to pay for software (see Jobs’ argument for songs above). Chapter 10: How Big is the Free Economy? At the macro level, Free addresses how people perceive the value of products and services, and this is very valuable for understanding human behavior. Free or subsidized products and services are a part of this larger whole. As the examples show, free can enable entire new business models, so like other innovations, it has immense potential for innovation and disruption of numerous markets. Innovation becomes most potent when you adopt ecosystem thinking, as Chapter 2 explains in the 3-party market section. “Free” often drives demand for something else. Ryanair, for example, works because customers often feel like they got a great deal, so they order add-ons like movies, food, or bag checking, which can be more profitable to provide. The global examples of music in China and Brazil are worth watching because they don’t have the same legal or cultural constraints as in “developed” economies, but adoption may indicate latent potential in other markets. Behavioral economics is receiving intense interest by commercial and government organizations. Here’s a recent presentation at Action Design Chicago on the psychology of scarcity that shows how people trade money for time.